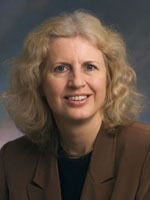 Susanne E. Hambrusch is professor of Computer Sciences at Purdue University. She received the Diplom Ingenieur in Computer Science from the Technical University of Vienna, Austria, in 1977, and a Ph.D. in Computer Science from Penn State in 1982. In 1982, she joined the faculty at Purdue University. She served as the Department Head of the Computer Science department from 2002 to 2007. She has held visiting appointments at the Technical University of Graz, Austria, and the International Computer Science Institute at the University of California, Berkeley. From 2010 to 2013, she served as the Director of the Computing and Communication Foundations (CCF) Division in the CISE Directorate at NSF. She successfully led the development of several new crosscutting programs including Cyber-Enabled Sustainability Science and Engineering (CyberSEES) and eXploiting Parallelism and Scalability (XPS), and the US-Israel Collaboration in Computer Science. Professor Hambrusch's research interests are in query and data management in mobile environments, computer science education, parallel and distributed computation, and analysis of algorithms. She has lead two projects in computer science education, "Science Education in Computational Thinking (SECANT)" and "Computer Science for Education (CS4EDU)". Her research has been supported by NSF, Air Force, ONR, DARPA, Microsoft, and State Farm. She has served on the board of directors of the Computing Research Association (CRA) and the CRA Committee on the Status of Women in Computing Research (CRA-W). She was a co-director for CRA-W's career mentoring workshops and she oversaw programs focused on undergraduate research experiences. She currently serves on CRA's Taulbee Survey Committee and she is a co-chair on CRA's education committee. She has served on the editorial boards of Information Processing Letters and Parallel Computing, and she currently is a co-chair for CACM's Viewpoints section. Her recognitions include inaugural membership in the Purdue University Book of Great Teachers, a 2003 Outstanding Engineering Alumni Award from Pennsylvania State University, and 2004 TechPoint Mira Education Award Winner. Aman Yadav, Ninger Zhou, Chris Mayfield, Susanne Hambrusch, J.T. Korb, "Introducing Computational Thinking in Education Courses", 42nd ACM Technical Symposium on Computer Science Education, 465-470, 2011.